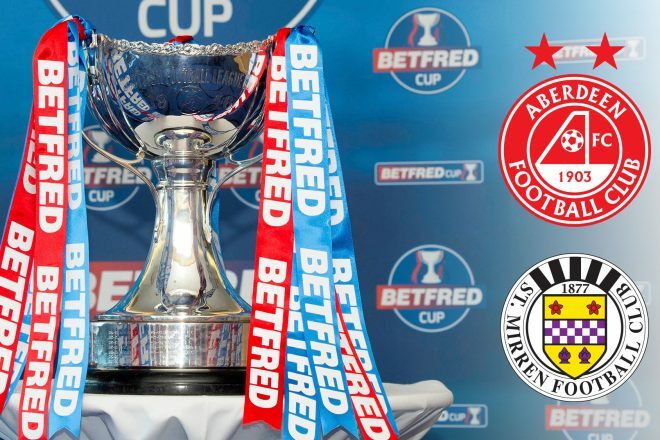 Saturday sees the return to cup football as The Dons welcome Premiership new boys, St Mirren to Pittodrie in the second round of the Betfred Cup. It’s been a busy week at Pittodrie with Manchester United striker James Wilson joining on a season-long loan to spearhead The Dons attack and could make his debut on Saturday. Six years have passed since the teams faced each other in the League Cup, with Saints beating Craig Brown’s men on penalty kicks in the Quarter-Finals on their way to lifting the trophy. Last season Aberdeen were able to overcome the then Championship leaders in the Scottish Cup with a resounding 4-1 win at Pittodrie. Alan Stubbs’s side came through the group stage of the competition as one of the best runners up finishing on nine points behind Kilmarnock with The Dons entering at this stage due to Europa League participation. The only time the Paisley club have lifted the trophy was in 2013 when they beat Hearts 3-2 in the Final at Hampden, with The Dons’ last victory being in 2014. On Thursday lunchtime Derek McInnes and Stephen Gleeson spoke to the media ahead of the cup tie. “When you play against Premiership opposition in the cup it’s always a tough game. The fact we’re at home I’m pleased with and hopefully we can put in a good performance. St Mirren under Alan have recruited well and there’s a lot of optimism there as you’d expect with a newly-promoted team and I’m sure they’ll come up here with no fear. Cup ties are all about getting through and obviously we want to bring a top performance and a performance we’re striving for and if we’re good enough on the day hopefully it’s good enough to get through the tie. The cup’s very important for every team for loads of reasons especially teams in the Premiership who will aspire to go the whole way and we’re one of those clubs. Hopefully we can get off to a winning start in the cup and get through to the next round. “It’s a great group to come into. I’ve been here since pre-season and over the last year I’ve been at three clubs and it’s been so easy to settle into this group. It’s a good group so anyone coming in is going to settle in and I think the manager would like bring more in to help with competition, which is always good for a squad. James will be the same and he’ll add to the squad so I’m looking forward to training and playing with him. “I got a little setback in pre-season, which I wasn’t too happy with. I didn’t start the Burnley games and I was a bit disappointed in that, but to start the first two league games was pleasing. The Rangers game was a tough game and I don’t think the sending off did us any favours either because we had a game plan. Last week it was good to get the first win. I think I’m getting there and hopefully I will get a few more games under my belt and bring more to the team. I’m fairly happy with my start so far. This will be the 17th occasion Aberdeen and St Mirren have locked horns in the League Cup with The Dons having the far superior record of 10 wins and only two defeats. An interesting fact is that in all but two occasions The Dons have won the League Cup they have faced St Mirren. The winner of the last two meetings between the sides have gone on to win the Cup, with St Mirren in 2012 and Aberdeen in 1995 respectfully. The Red Matchday team have put together a full head to head article which you can read here. If you can’t make the match on Saturday then you can join us on RedTV alongside special guest commentator, Mark Reynolds. Post-match we will have all the reaction including highlights, goals and a full match replay. A dominant first half performance which featured goals from Mackay-Steven, Shinnie & May sent The Dons well on their way to the last 8 of the Betfred Cup. Mackay-Steven doubled his tally in the second half from the penalty spot on a day when Aberdeen were just far too good for their opponents. Initially Derek McInnes made one change to the team that started last week’s match at Dens Park with Scott Wright replacing Sam Cosgrove. New signing James Wilson missed out on the squad after picking up a knock in action for his parent club last week. The Dons were forced to make another change a few minutes before kick-off when McGinn picked up an injury in the warm-up, his place in the staring eleven was taken by Frank Ross. Straight from kick-off Shinnie found Mackay-Steven on the right, he beat his man and crossed low for May who got his effort on target, but it was well saved from Samson and a sign of things to come in the opening stages. A couple of minutes later Mackay-Steven was threatening again and produced another quality cross to find Ferguson lurking in the area, the midfielder connected well with the header but Samson produced a fingertip save to turn the ball over the bar. From the corner Ball hooked it towards the back post and Ferguson prodded the ball just wide of the post from 8 yards. It was a very energetic and positive start from The Dons. There was then a great break from Wright in the 7th minute. The youngster had perhaps taken confidence from the start Mackay-Steven had made on the opposite wing, after running from box to box Wright moved the ball onto his right foot and hit a strike which was unfortunately straight at Samson. There was ultimately no reward in the opening ten minutes but the style of play and approach offered plenty of encouragement to the home support. In the 13th minute St Mirren had an effort of their own when Brock-Madsen met a free-kick with a powerful header after finding space on the six-yard line, thankfully the effort lacked direction and ended up comfortably over the bar. That proved to be a blip as Aberdeen went back on the front foot and were rewarded with the opener in the 16th minute thanks mainly to very positive play down the left-hand side from Ferguson. The youngster used speed and strength to hold off the challenge of his opposite number before clipping the ball to the back post for Mackay-Steven to connect on the volley, his strike was powerful and with the aid of a deflection made it’s way into the back of the net. Just three minutes later the lead was doubled when Mackay-Steven got the better of his man once again and floated the ball into the area for Shinnie to meet, the captain showed ambition and bravery to beat his man to the ball and left Samson with no chance. The Dons were on fire and had a third when a slack pass from Samson was intercepted by Scott Wright, the youth academy graduate then strode past the keeper without breaking sweat and could have went on his own with just one defender to beat. Instead Wright opted to square the ball for May and the striker made no mistake to net his first goal of the campaign. It was another ten minutes before the next clear cut opportunity was created when Shinnie found acres of space on the left before driving a low cross towards the near post, unfortunately it was just a foot or two in front of May who couldn’t make contact despite his best efforts. The visitors did pick up on a few loose passes but were unable to muster much of a test for Lewis before the half-time break. There was still time for a couple more good chances for the hosts though. First it was Mackay-Steven who tested Samson after getting the beating of Coulson and this time the keeper was equal to the low shot. With just seconds remaining in the half May retrieved a long ball into the channel and found Ross on the edge of the area, he completed a one-two before threading the ball through for Shinnie who saw his low drive pushed clear by Samson. The skipper would have been disappointed not to double his tally for the day as it was a great opportunity. All in all, a very impressive half from The Dons. The Dons started the second half in the same manner when Scott Wright broke into the area to get one-on-one with Samson, his strike was blocked and fell for May but he was unable to direct the ball towards goal. In the 56th minute Aberdeen had a chance to make it 4-0 from the penalty spot when Mackay-Steven beat his man with a great piece of skill just inside the area before being brought down. The winger was full of confidence and subsequently took the penalty squeezing the ball past Samson to get his second of the match. On the hour mark Forrester replaced Ross who had given a good account of himself after being thrust into the team at the last minute. Moments later former Don Cammy Smith was afforded a round of applause from the Red Army as he left the field but it was a disappointing afternoon for the forward who was hardly in the game. With twenty minutes remaining Wright was replaced by Anderson and the youngster would have considered himself unlucky not to get on the scoresheet after an impressive performance. For the final ten minutes McLennan replaced May up front. On another day May could have added to his goal tally but would have been delighted to get off the mark for the campaign. McLennan was making his first appearance at Pittodrie after being called into the squad at the last minute due to McGinn’s injury. Anderson has been beginning to make a name for himself from the bench and did well to test Samson with a volley from the edge of the area after a looping cross from Mackay-Steven, the young striker’s technique was perfect but Samson was in the right place to deal with the strike. The match had fizzled out a bit as The Dons took their foot off the gas but the work was done after a devastating first half performance ended the match as a contest. 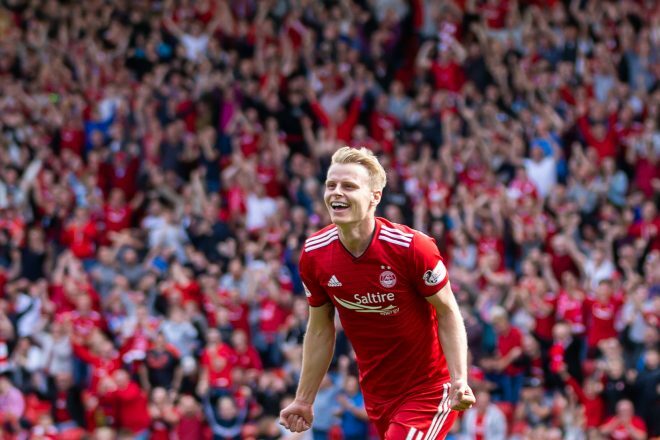 Ultimately a fine display ensured that Aberdeen would head into the last eight of the Betfred Cup.